The lights are switched off and the dirty dishes are being cleaned. But on their way home, the participants of the International Civil Society Week (ICSW) still have a lot to chew on. Last week they collected new ideas and insights on civil society during the week long global event. For the first time ICSW was hosted in the Pacific, to focus on some of the world’s most vulnerable islands. 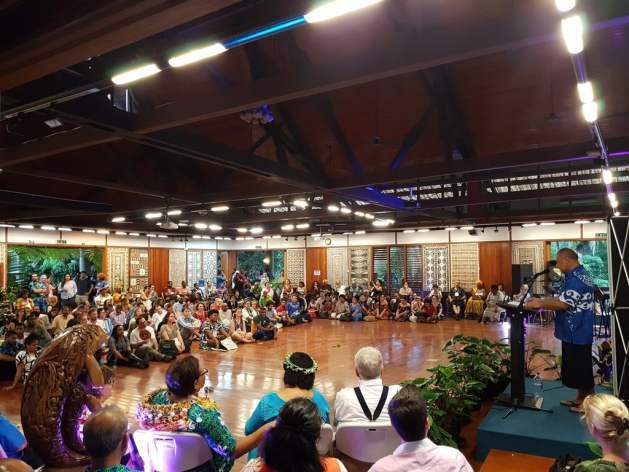 SUVA, Fiji, Dec 13 2017 (IPS) - More than 700 activists gathered in Suva, Fiji’s capital, to explore the latest trends – from climate change to human rights, from innovation to social justice. Anything that can help empower and mobilise citizens. The lively debates in panel discussions, workshops and lectures made the event look like a carnival of creative new ideas and tested knowledge. The Innovation Lab brought together human rights defenders to share their tools, tactics and strategies. Oxfam addressed the long term problems that the 300 nuclear tests in the Pacific had caused. And the Public Interest Registry taught participants how to inspire donors to give and supporters to take action. A lot of attention went to activist stars like Kumi Naidoo (Greenpeace, CIVICUS, …), Helen Clark (former prime minister of New Zealand) and José Ramos-Horta (former president of Timor-Leste). The youthful and charming winners of the ‘Nelson Mandela – Graca Machel Innovation Awards’ won many hearts when the annual prize was handed out. For the first time this global event was hosted in the Pacific. The conference focussed on the plight of small islands affected by rising sea levels and more frequent and extreme weather. “The peoples of the Pacific, like those in other small island states, have to tackle the devastating impacts of climate change alongside other development challenges,” says Danny Sriskandarajah, secretary general of CIVICUS. CIVICUS, an alliance for citizen participation, organized the conference in cooperation with PIANGO, the Pacific Islands Association of Non-Government Organisation. Fiji has taken a leading role in the Pacific to address climate change. The republic has already presided over the United Nations Climate Change Conference (COP 23) in Bonn and co-hosted the UN Oceans Conference in New York earlier this year. It collaborates closely with other Pacific states and territories. Speaking at the closing event, Joanna Kerr – the Canadian head of Greenpeace – said that the problem of climate change will require enormous civil society mobilisation to address. “The problem is so huge it can be hard to stay optimistic. But the hope and resilience of the Pacific gives us hope.” She applauded the ordinary Pacific peoples’ appreciation for climate change. Another inspirational voice of hope was that of Victor Ugo, a Nigerian doctor. He came to ICSW to collect his ‘Nelson Mandela – Graca Machel Innovation Award’ for his work on developing awareness on mental health in Nigeria. He experienced several eye-openers at the conference. “I’m eager to go home and try out all the things that I’ve learned here in Fiji. I want to help people with mental illnesses to speak out so they can achieve something in their communities. There is still an awful lot of work to do in Nigeria on mental health. But challenges are not restrictions,” Ugo said. If conferences are about motivating people to keep on going forward, then ICSW has done its job.